Microsoft SQL Server database administrators, sql developers, Business Intelligence (BI) professionals who are working with MS SQL Server 2005 and /or MS SQL Server 2008 can find detailed information on Microsoft SQL Server Certification Paths here. In many developer forums especially on topics related with certification, I read many post asking how is Microsoft SQL Server certification, what is the best Microsoft SQL Server Certification path for their career and for their current skills. In order to share my knowledge on Microsoft Certification exams, I will try to explain you what are the MS SQL Server certification paths currently valid and available. First of all, SQL Server professionals including SQL Server administrators, SQL developers and Business Intelligence (BI) developers should select the main certification track they want to be certified about. What I'm trying to say is that "you should decide which Microsoft SQL Server version you want to be certified upon". Since today Microsoft supports MS SQL Server 2005, MS SQL Server 2008 and MS SQL Server 2008 R2 versions, SQL professionals can choose a career certified by one of SQL Server 2005 certification path and SQL Server 2008 certification path. There is no SQL Server 2008 R2 certification path. If you are wondering why there is not a Microsoft certification path for SQL Server 2008 R2, the reason is that SQL2008 R2 version is not considered as a main update on SQL Engine itself. And the truth is it is not. You can see that the SQL Server 2008 R2 build number is 10.5 something like that. It has still the major build number 10. Since there are many new and improved tools that are released with MS SQL Server 2008 R2 especially related with surrounding data platform elements, like BI (Business Intelligence) elements, or Data Warehouse applications, PowerPivot integrated with MS SharePoint Server and Excel on the clients the new SQL Server 2008 version is marked and named with R2. That's the story of SQL Server 2008 R2 naming in short. It does not matter which SQL Server version you choose to be certified, each version has its own certification exams on similar topics with different exam numbers. 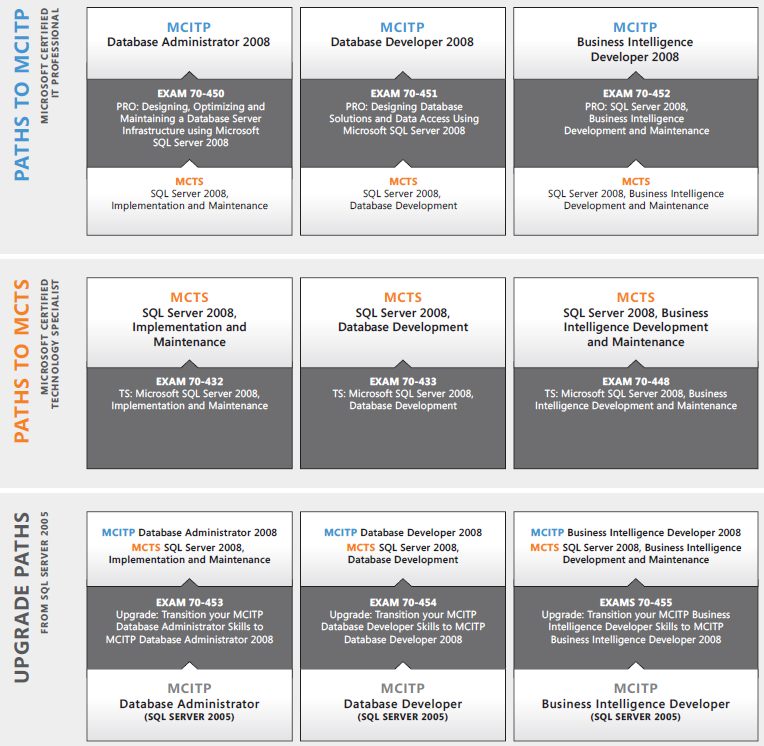 If you are planning to take Microsoft Certifications on MS SQL Server 2008, please download Microsoft SQL Server 2008 Certification Paths for possible certification paths available for this product. Basically SQL Server grants certification on three main tracks. After the Microsoft SQL Server 2005 introduced with advanced Business Intelligence products, Business Intelligence Certification or Business Intelligence Developer Certifications are very popular and valuable for the owner in his or her career. The importance of Business Intelligence certification is increasing with the improvements in BI Tools (Data Warehouse, Data Mining, Analysis Services and Reporting Services, PowerPivot) of following SQL Server versions like MS SQL Server 2008 and MS SQL Server 2008 R2. I want to list the SQL Server 2008 Certification Exams that grants credit for SQL Server 2008 Certifications. Note that the SQL Server 2008 certification exams with UPGRADE codes are one exam that grants upgrade from SQL Server 2005 MCITP certification to SQL Server 2008 MCITP certification. From my experience on Visual Studio certification exams, the upgrade exams are difficult to pass. Because actually you got all topics that are normally distributed to two or three certification exams in one exam. And you are required to pass in each part with minimum 700. So if you fail in one section of upgrade exams you have to retake all exameven you make better scores than required in other sections.